This article describes upgrades to Pega Customer Service (formerly Customer Process Manager, or CPM) 7.1 and newer versions, and only applies to users who will continue to use the legacy portals (CSR Portal, Manager Portal, Sales Rep and Sales Manager Portals). Users who are upgrading to Pega 7.1.3 and later versions and will adopt the Interaction Portal or Account Manager Portal can skip these instructions. Pega Customer Service 7.1 and newer versions use configurations set in the pyDefault data transforms in the interaction classes to identify starting activities and set the default interaction type values. You must configure this rule for each interaction class in order for the application to function properly. Use the Interaction Types landing page to specify the starting activity and default interaction type. Access this page by clicking Designer Studio > Customer Service > Interactions > Interaction Types. For each interaction type in your application, expand the row and click Update. If prompted, enter Save As RuleSet information. Enter the appropriate default interaction type value and select a starting activity. Starting activities were modified to use the interaction type default value from the pyDefault data transform in the interaction classes, rather than setting them using Property-Set operations within the starting activities themselves to improve configurability. If you have created custom starting activities for your work types, you should make similar changes in your versions of these rules, as displayed in the following image. 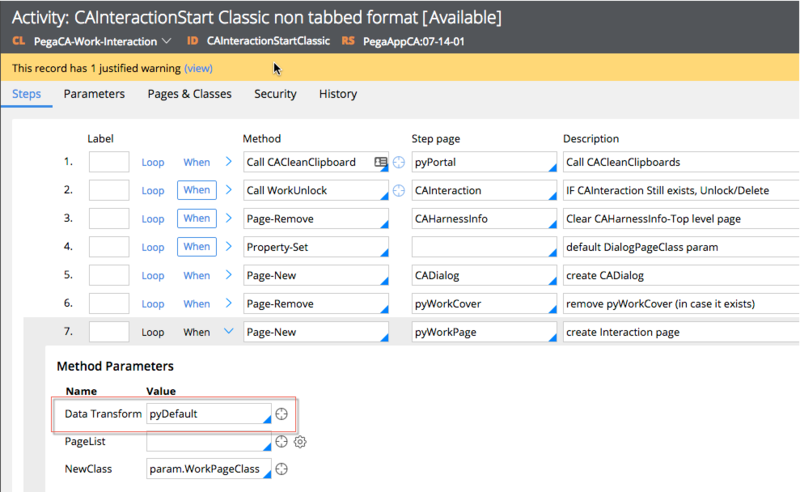 Additionally, Pega Customer Service has modified the CADefaultValues activities in the interaction work classes to set the interaction type value from the Primary page. If you have overridden these activities in your custom configuration, you should make similar changes.